For 5 years, Montirius has been collaborating closely with the Spanish cork producing company ‘Rich Xiterta’ to create and develop a unique cork, equally unique for its corking properties as to its respect for the environment. 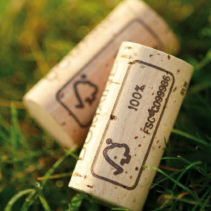 The return on this rare, original and fruitful collaboration is that today the result is the commercialization of a FSC certified cork, no doubt the most successful on the market both in terms of environmental and quality requirements. It is a lovely story based on confidence, the spirit of excellence and research which started five years ago. In 2007, Mr. Fabrice Forment, the French representative for the Rich Xiberta company, contacted us to present his project to commercialize corks which he calls ‘CRU’. Mr Forment chose us because he knew that here at Montirius, our demands both in terms of quality and constantly keeping everything we do’ natural’, are very high. He was searching for wine making domains that would agree to launch themselves into a research and development venture. He explained that his ‘CRU’ corks come from a hundred year old Spanish cork forest near Valencia. This forest has never been treated with either chemicals or pesticides; the trichloroanisoles more commonly known as TCA (the molecules found in the ‘corked’ taste) come largely from insecticides spread over the cork forests. He further explained that these ‘CRU’ corks are brown in colour instead of white, because there has never been a peroxide treatment of the cork forest. (See the explanation of the cork specifications page 4). 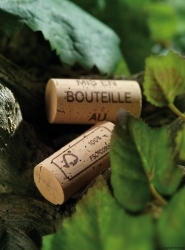 Most buyers of cork in the world buy regarding the visual aspect of the product rather than its corking quality. 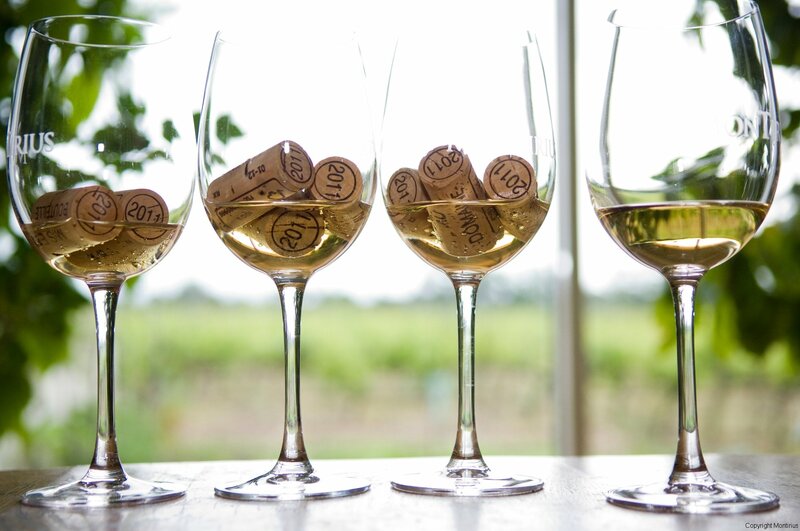 A white cork gives a better visual impression than a brown one. What counts for us – the ‘Saurels’ is the quality of the corking rather than the visual aspect. The cork is the final and very necessary element to protect the wine and to accompany it during its maturing and ageing process. 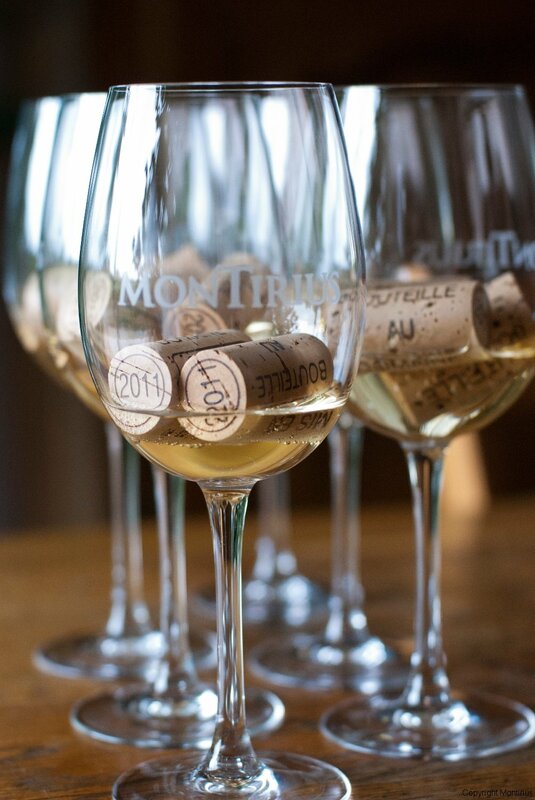 Without a good cork, all the care we give to our wines and from vines to the bottles makes no sense. On the 23rd August 2007, Eric, Justine and I (Christine) decided to launch into this adventure. It was the start of four years during which we co-designed and co-developed a cork, with supporting exchanges, questioning, experimenting and verifying. At every stage of the manufacturing process, from the forest to the winery, we brought up new points of questioning, and each time Fabrice went off to find the answers from the technicians, to put in place each missing link in the chain so as to reply to the exacting quality criteria demanded. One example, was the water used to wash the sheets of cork extracted from the forest chlorine free ? Are there water analyses results to prove it ? At the end of one year, the Rich Xiberta company was equipped with another certification for its ‘CRU’ corks. It is the FSC certification to which we added certain specifications for our domain here at Montirius. (See the following pages). The first vintages to be corked with this ‘CRU’ cork certified FSC at Montirius, are the 2008,2009,210,2011 vintages. For our domain, we put together a specification which summarizes the entire process we wanted applied to our Montirius corks. These are the precise technical characteristics of the specification for the ‘CRU’ corks Montirius, FSC norms. ‘CRU’ Cork, that is to say bio, except that AB cannot be stamped on the corks. The 100 year old forest was never treated chemically against insects. Certified FSC means that in the cork forest, the felling is organized so as to ensure re-planting of trees. The production site is ESLIDA which is a naturel park of 30.000 hectares protected by the Spanish government, in the province of Valencia. Length of the Cork. 44/49 mm. The’ Bourgone/Ducasse’ traditional bottles used by Montirius have a bottle neck of 63mm. 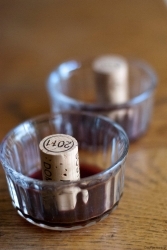 It is in fact important to leave a space of 10 mm between the wine and the base of the cork so as the wine can expand depending on the exterior temperature. Diameter 24.2 mm. This diameter is a specification demanded by Montirius. It guarantees a diameter of 24 mm, which is adequate to optimize the sealing of the bottle neck. Density: 160-190 kg/m3. This level of density allows us to cork both red and white wines. With a higher density, the amount of air which can penetrate the bottles is smaller. The exchange of exterior air with the bottled wine is more regular, and gives a better protection to the wine. Note that the norms of the charter of cork makers is on a scale between 125 and 230 Kg/m3. Simulating wine to test the cork. The tests were done in Spain with samples using a hydro alcoholic solution of 12%. It is now forbidden in Europe to use wine macerate. Capillary Test. Methylene blue was used on randomly chosen samples to verify the the sealing quality of the cork. If the cork is well waxed with paraffin, the methylene is not absorbed and no colour is visible in the soaked corks. Sorting of the explanations given in points 1 & 2. The Washing of the corks was done in a solution of peracetic acid which contains only 1% peroxide. Peroxide is a very good anti-bacterial. It is normally used in a higher volume than 1% to wash cork originally brown in colour, which then gives it a white colour. This 1% solution of peroxide corresponds to the minimum quantity which can be used in the washing process of cork to ensure the destruction of bacteria. The peracetic acid is then recovered and re-treated by RICH XIBERTA. Rinsing of the corks was done using sparkling water from a source found in the town of Caldes in Spain, where RICH XIBERTA is situated. Even though this water does not contain chlorine naturally, the company uses a de-chlorinator at the exit of the well to ensure total security. The water from this source, used to rinse and boil the cork sheets, is totally absorbed by the cork. There is no discharge into the land. Treatment of the Surface. A well paraffined cork avoids leaking and seeping of the wine to the top of the cork. To attain this we use only solidified heated paraffin. In fact, only solidified heated paraffin is guaranteed 100% and therefore without additives. We stopped using latex because RICH XIBERTA (and all the other cork makers), could not guarantee a 100% natural latex. The same thing for silicone; we stopped using it because it attracted too many exterior odors, giving an exogenous taste to the wine. Having to use only paraffin meant using greater quantities to facilitate removal from the bottle neck. The only risk : the cork ‘sticks’ a little more to the surface of the bottle neck in the case of the white or rosé wines which are kept cooled. The cool conditions, limit the ease with which the cork can be extracted. It is a risk we are prepared to take to protect the quality of the wines. The packages are prepared with SO2 to avoid any contamination during transport. The use of plastic pallets avoids contamination of the corks by the treated wood of wooden pallets; The packages are transported directly from the factory to Montirius. There is no change of transport truck during the journey. This guarantees that the corks are not in contact with odorous products which we could not detect on arrival. Extra Tests: With the arrival of the corks at Montirius, we inspect the truck and the interior of the trailer so as to detect any possible odors which might impregnate the corks. If this were to happen, we would refuse the whole delivery. This has never happened until now. As well as the above, a few days before bottling, we take random samples of corks from packets and from batches. 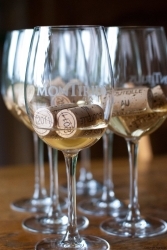 We take five glasses and soak two corks per glass in white Montirius wine for 24 hours, before tasting each glass. The taste of cork is either present immediately or not at all. If after 24 hours the wine tasting of the five glasses does not show any suspect taste, the batch is used for the bottling. In the opposite case, we call the cork maker to come to observe and note; we do not use that batch of corks. Until now this has never happened. So as to verify the paraffin coating of corks, we take random samples of corks when they arrive to us, and put the heads into red wine. This allows us to see if there is seepage of wine into the cork. If the paraffin coating is good, there is no seeping! In the end the energy used over these past five years to develop these ‘CRU’ FSC certified corks, with Fabrice Forment French representative of RICH XIBERTA and Silvestre Sune, technical director is today rewarded. 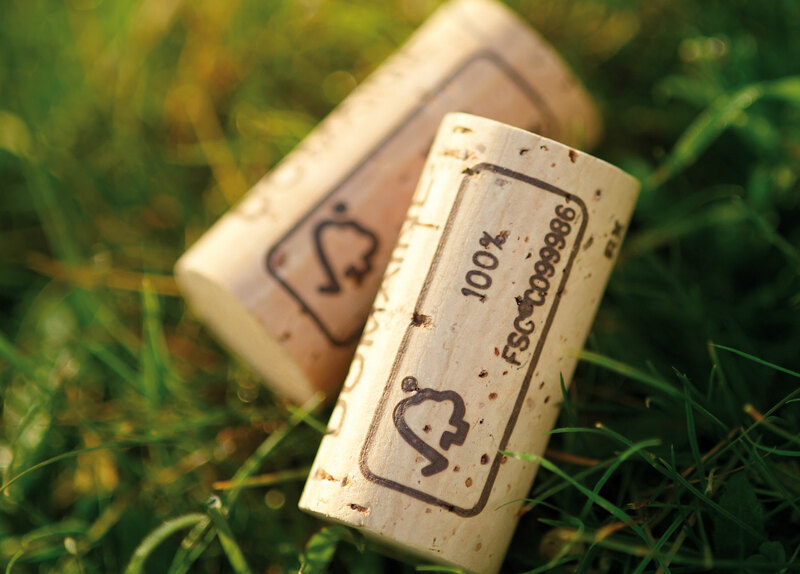 We have a natural cork of an unquestionable quality which has a reduced environmental impact. For us it is an extra pledge of security coherent with our process and we are particularly proud of the result!